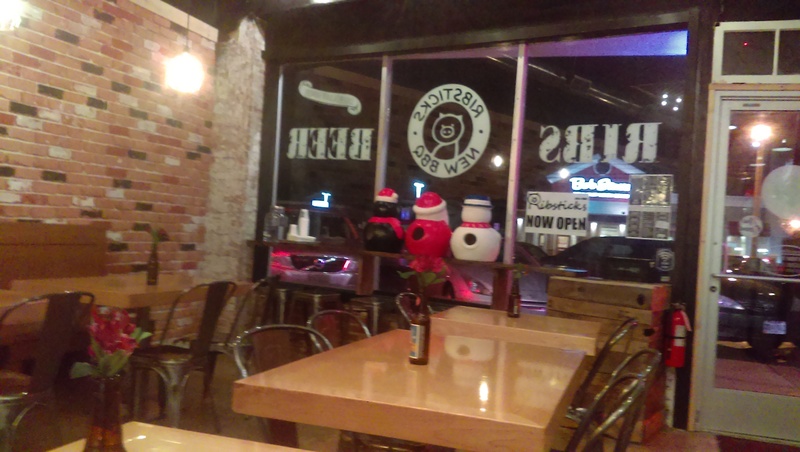 I like to keep aware of what is going on around me on the local restaurant scene, so I noticed one of the storefronts across from Cedar Center on Cedar Road had paper up on its windows a few months ago and then a sign announcing a new barbecue place called Ribsticks. After what seemed like forever they have finally opened – quietly. I was curious and did a Google search one night and stumbled on a Scene article about it. The article reports that Dr. Lee cooks his ribs in a sous vide bath, then smokes and grills them, resulting in less shrinkage and more meat. I can attest to that. The portions are great with reasonable prices as an added bonus. 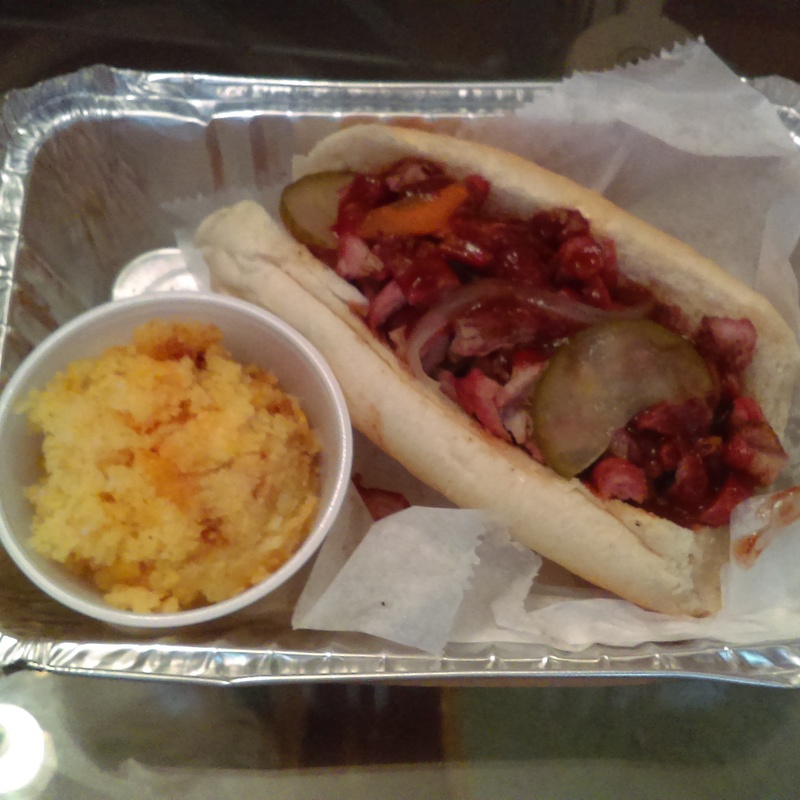 I initially ordered a Burnt Ends sandwich ($7.50 but $1 off at lunch). It comes with one side at lunch, and I opted for the corn casserole. The corn casserole was absolutely amazing. It was a nice consistency with some chunks of corn. It was the side of the day, so if you see it be sure to order it. The Burnt Ends sandwich was not as burnt as I would have liked it. My idea of burnt ends is the burnt ends at Oak & Ember; they were so tender they were practically falling apart. The burnt ends here are chewier, because they aren’t cooked as long as the ones I have had in the past are. The bun is housemade, and the sandwich is topped with housemade pickled veggies and caramelized onions. It was a bit sloppy to eat, and I wasn’t thrilled to find a small bone in among the meat. That said, I was still looking forward to trying other things on the menu. I organized a dinner there a few days later. I focused on the ribs. The pork spare ribs with two sides, to be exact, for $14.00. I ordered a third side just for good measure for $2. My meal was really good. The ribs were actually a combination of fall-off-the-bone and stick to the bone. 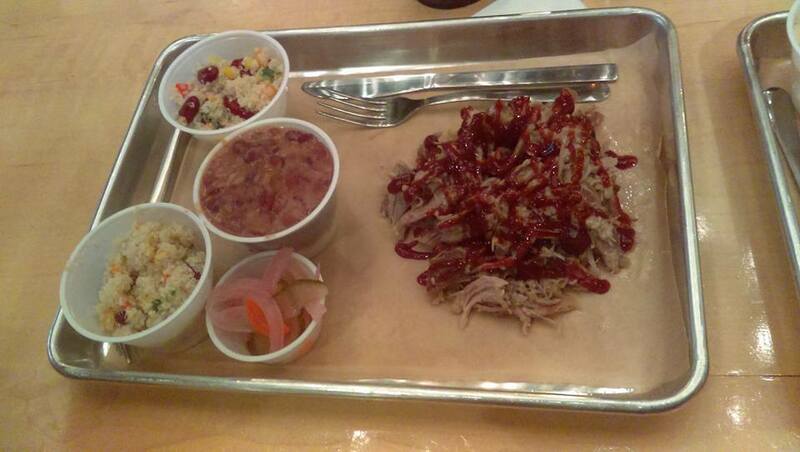 The meat was plentiful and chewy, and I enjoyed the barbecue sauce. 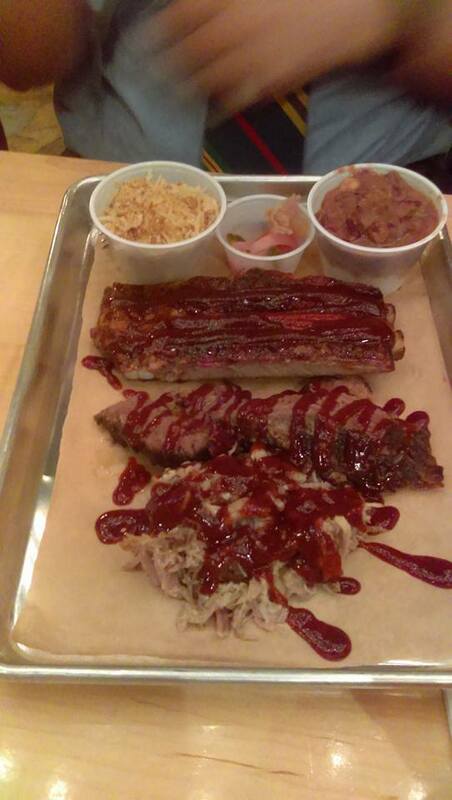 You can order samplers with two and three meats, featuring the pork spare ribs, pulled pork, beef brisket, chicken wings and beef short ribs. They also recently added kielbasa and the burnt ends to the options. 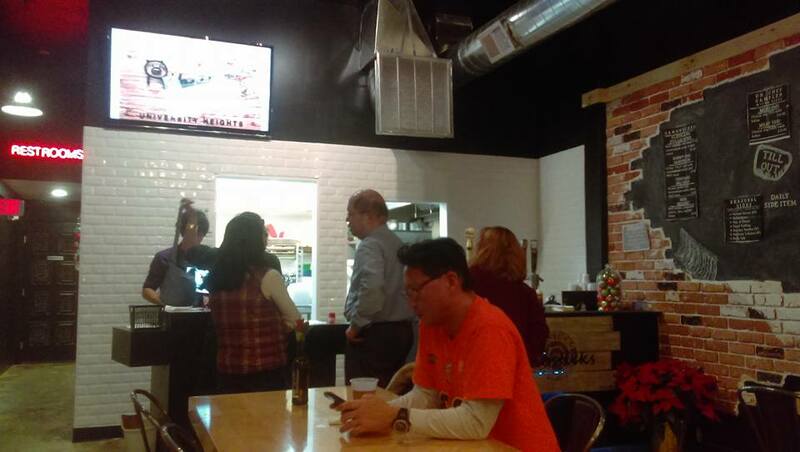 They are tweaking the menu as they go along and adding things like Beer Bites and BBQ pulled pork nachos. The stars here are the sides; they are absolutely amazing. You can choose herbed quinoa (gluten-free), couscous, baked beans, mac n cheese, bread pudding, bourbon peaches, heirloom coleslaw, red beans and rice, mashed potatoes and a daily side. 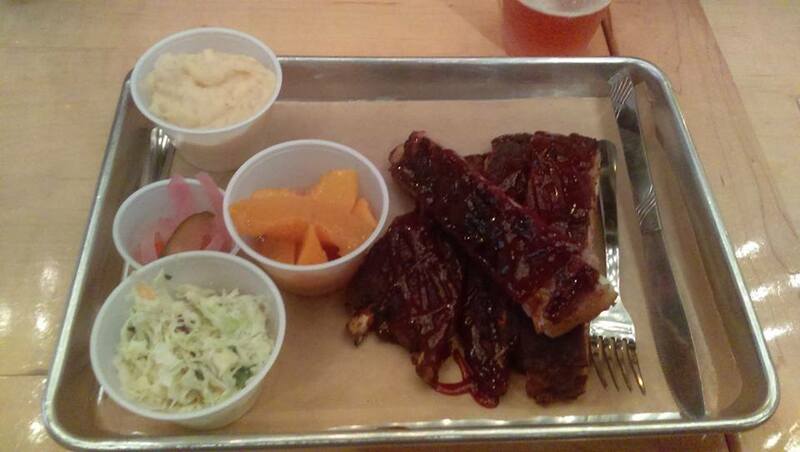 I ordered the mashed potatoes, bourbon peaches and heirloom coleslaw, which were all delicious. I bought more mashed potatoes and peaches to go with my leftover rib to enjoy the next day. The mashed potatoes are creamy, I could taste the sour cream. The bourbon peaches are to die for. I could have kept eating them forever. The heirloom cole slaw was also refreshing. I also hear the cheese grits are amazing as well. Sadly the side portions are small, but you can always order more on the side. As for beverages, they offer sweet tea and soft drinks (Pepsi products) as well as alcoholic libations. They have Great Lakes beer and Coors on tap and IPA, and you can add a shot of bourbon to your sweet tea. I thoroughly enjoyed my Dortmunder with my ribs. You can help yourself to sauces near the register and water in a corner by the window. They also have several desserts, most intriguingly a candied pork ends and chocolate chip cookie. I have heard the cookie is great but haven’t had the pleasure yet. The service was great. The staff was very friendly and accommodating. The manager and owner were both present and very hospitable. We will definitely be back. In fact, several of my dining companions have already been back. 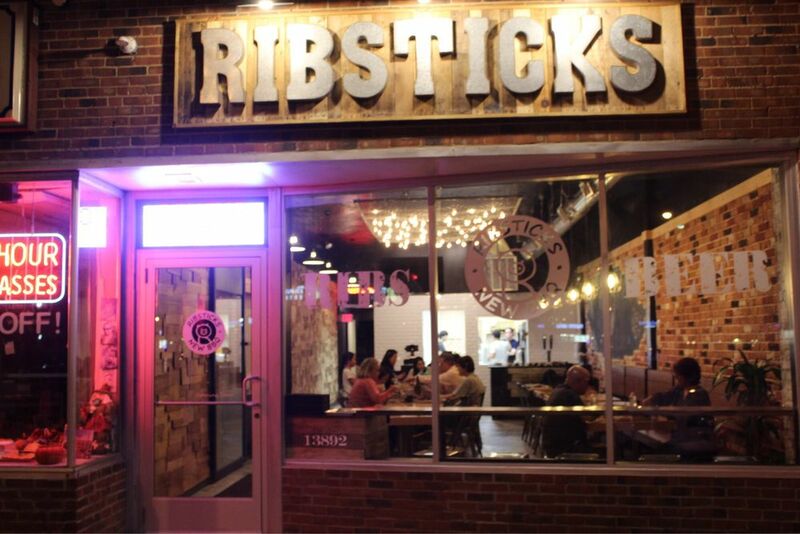 Welcome to the neighborhood, Ribsticks!